Last Saturday Lakes Martial Arts enjoyed our largest participation in a regional tournament! There were lots of smiles, medals, and signed belts from Grandmaster M.K. Lee. Students that participated in the tournament also were able to check off one of the nine requirements towards a black belt! Special thanks to the parents for sharing their photos (Alice's Mom and Jayden's Dad especially). There was lots of TOUGH competition - a state champs, district champs, and higher-ranked competitors. I was proud of the black belt attitude demonstrated by the Lakes Martial Arts students! And perhaps next year we will participate in more events including weapons sparring and creative forms! Mr. Kern enjoyed his tournament competition ring as well... a combined ring of many various ages and experiences of 4th and 5th degrees! Super Fantastic Winter 2018 Testing! Congrats to Winter 2018 students for a super fantastic testing! We welcome special guest Mr. Hogen-Chin and watched black belts rank 1-4 complete their forms in front of the group. We had two Tiny Tigers graduate to Karate Kids, and three new sparring students as well as leadership students. It's been a while since we had a combined testing and I will say I really loved it! See you back on the mat on Feb 14. It's the first time we've had class on Valentine's Day, but parents I promise it will be special! Congrats to Fall 2017 students for successful testing! Congratulations to Lakes Martial Arts students who successfully completed their testing on November 15 at Pershing Rec Center in Minneapolis. Special thanks to the efforts of the judging panel comprised of the Leadership Team including Mr. Gonzalez, Mrs. Reinhardt, Mr. Kamrow, and Mr. Nielsen. Four students earned their sparring gear and one Tiny Tiger graduated to the Karate Kid class next session! I'm super proud of your hard work and demonstration of excellence and courage both on and off the mat! Welcome Back Night is Sept 7 at 6:00 - 7 pm at the Pershing Recreation Center, an informal gathering and information night. Students should wear uniforms. Free to attend. All new & returning students will get a chance to get to know each other a bit more, students will get fitted for new uniforms (especially if they grew since last year), and learn about exciting program changes. We are excited to kick start our 5th season at the Pershing Rec Center! Congratulations to our successful color belts and black belt mid-termers at our Summer 2017 testing held June 29, 2017 in Minneapolis! 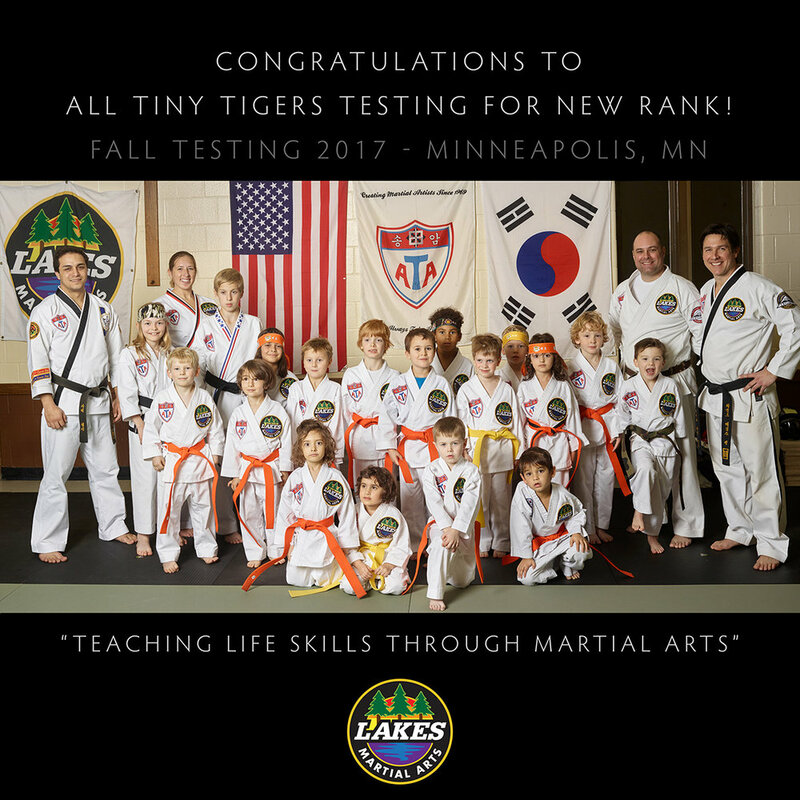 We had over 50 students test for a new rank (not all pictured here), a wonderful feat for an ATA Legacy club in Minneapolis! Enjoy your summer break and we will see you back in September! If you have ever asked a doctor, an olympian, or a champion of anything, there is one thing they will tell you: hard work will beat out talent any time! "If a man is called to be a street sweeper, he should sweep streets even as Michelangelo painted, or Beethoven played music, or Shakespeare wrote poetry. He should sweep streets so well that all the hosts of heaven and earth will pause to say, here lived a great street sweeper who did his job well." You might be smart, but unless you work hard, you may never achieve your potential. "It's hard to beat a person who never gives up," Babe Ruth once said. Beginners - Songahm 1 Tiny Tigers do first half of form (moves 1-9) and one-step #1. Board Break (Intermediate and Advanced): Front / side continuous kick combo (break is on side kick) without setting foot down. TESTING. Mark your calendars for our next testing held at Pershing Park Recreation Center at 5:30 pm (Tiny Tigers) and 6:30 pm (Karate Kids, Adults) on June 28, 2017. Some martial arts students worked 10 weeks to arrive at this point. Others worked almost 3 years. Yesterday, Lakes Martial Arts in Minneapolis held the Spring 2017 testing at the Pershing Rec Center. With a packed house, Lakes Martial Arts welcomes five new black belts! Congrats, Mr. Q. Bechay, Mr. D Bechay, Mrs. Reinhardt, Mr. Reinhardt, and Mr. Nielsen! The fitness test challenged students to focus and dig deep, pushing themselves beyond what they thought was possible. Students demonstrated strength, mobility, and power at they completed 30 seconds of clapping pushups and pistol squats, focused energy for 60 seconds doing V-sits, front leaning rests, burpies. Who would have thought that 4-minutes would last sooo long (for the students) and and be so fun to watch (for the audience)! I am proud of the hard work and time these students (and their families) have dedicated to their practice. The triangle of learning continues to strengthen. See you on the mat! One final note: It’s easy to think of a mistake as a failure. Get this: mistakes do not mean we aren’t good at something. It is important to focus that mistakes are when learning starts. Without mistakes, we wouldn’t improve. Many of the world’s most successful people made mistakes along their journey. Mistakes can be as simple as forgetting the kihap or a move in a form, not breaking a board on the first time, or losing a piece of sparring equipment. It happens to all of us. What matters most: learn and move on. And don’t forget to smile and enjoy the journey. Thirteen Lakes Martial Arts students competed in the 2017 ATA Twin Cities Tournament on Saturday. In doing so, they completed one requirement towards their Nine Steps in becoming a Black Black... and had lots of fun and were apart of our martial arts community at the same time! Mr. Kern was unable to make it it the the tournament since he brother was getting married (good excuse, Mr. Kern), but he was extremely appreciative of these moments captured by leadership team member and first-degree black belt recommended, Mrs. Reinhardt. Thank you Ma'am! Congrats to all Lakes Martial Arts students on demonstrating their Songahm spirit: Jack R, Quinn B, Drew B, Declan V, Logan B, Jordan B, Onie P, Otto R, Jessica R, Beckett N, Annika K, and Beckett L! Look at those happy faces! It will be fun to look back at this photo in a few years and see how they've grown!